Coverage: Live coverage BBC Sport Wales website, BBC Sport App from 1830. BBC Radio Wales from 1900. Dean Cosker says Glamorgan will not be affected by the Championship defeat against Lancashire as they bid for a T20 Blast quarter-final. The Welsh County face Gloucester in Cardiff in their last South Group match on Friday. 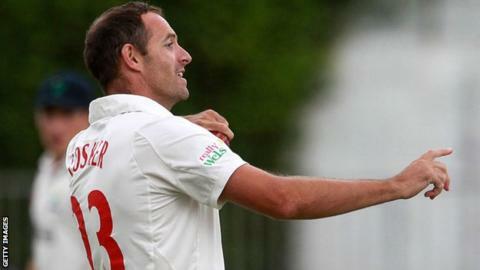 Glamorgan lie fifth and are determined to make up for their innings-and-157-run thrashing by Lancashire. "It's completely different cricket and a different mindset with different players," said spinner Cosker. Glamorgan need to overtake either Essex or Sussex to get into the knockout stages. But heavy rain forecast for Cardiff on Friday could end their chances if no play is possible. The top four in South and North groups make up the last eight, with the top two in each having home advantage. Glamorgan's win over Kent was the latest in a series of last-ball victories for the Welsh county, but two heavy defeats against Sussex mean they currently have a poor overall net run-rate, which could count against them if they finish level on points with any of their rivals. "Hopefully we can wrap it up before the last ball of the last game but we're just looking for a solid, gutsy performance against a strong Gloucester side who have shown some strong performances in T20," said Cosker. "We've got some fantastic winning memories of playing Gloucester early in the competition, so our hopes are high." Head coach Toby Radford also believes the squad will manage to put the week's four-day struggles behind them for a second successive time. "I'm very confident, we came off a loss last week at Chelmsford but then managed to beat the South Division leaders Kent by one run on Friday night, so we turned that around." "Everyone will be up for this game, it's still a massive game. We want to qualify for the quarter final, of course we'll need other results to go in our favour but no concerns about people being up for it."